Christmas Countdown: There are just 13 weeks until Christmas! Hi, my name is Jess. I'm addicted to felt. Before ya'll laugh, I really am. Laughing aside, I'm in love with this project. So much in love that I made four: one for Bug and three for gifts this year. This project is relatively quick, super simple and easy on the wallet. My total out of pocket cost was $3.57 including tax. The only bit I had to purchase that wasn't already in my stash of crafting goodness was the buttons. And I have enough buttons left over to make two more of these games in the future if I so choose. Measure out two pieces of felt that are 6 x 6. Cut out. On one piece, measure and draw lines, using the chalk. The lines should be two inches apart. Two lines will be horizontal and two lines will be vertical. I drew one set of lines, then sewed, then drew the other set of lines. Pin the two pieces together, and sew along the chalk lines with thread. Put 12 buttons (6 of one color, 6 of another) into a pouch, bag or some other container. Play tic tac toe to your heart's content! I first saw this idea in a Family Fun magazine. I love, love, love this idea for littles in your life. If you have littles of your own of an appropriate age, ask them to make this game with you. 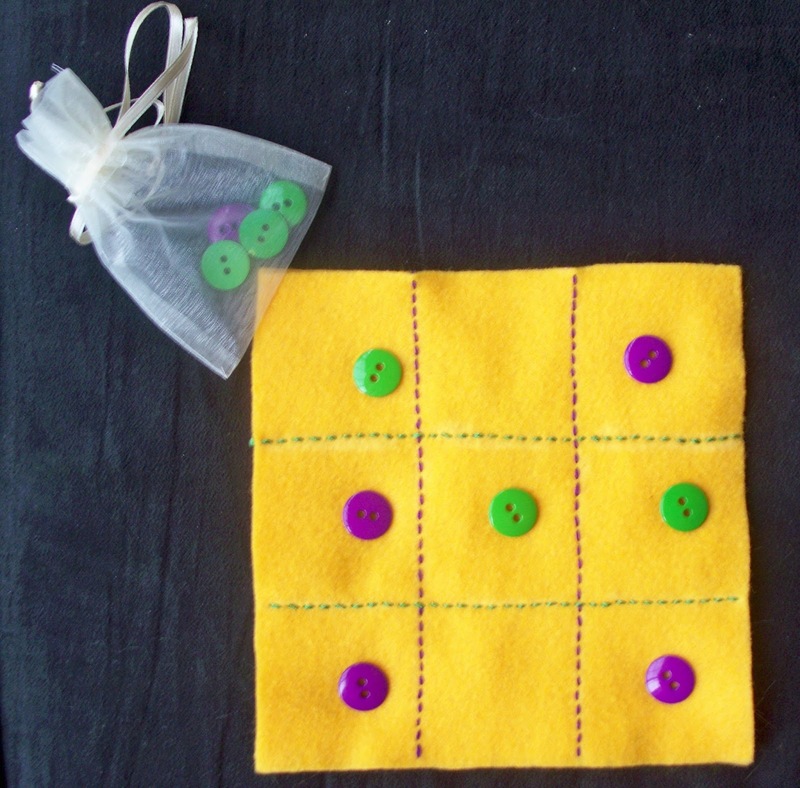 It's very simple and a good way to practice basic sewing skills.